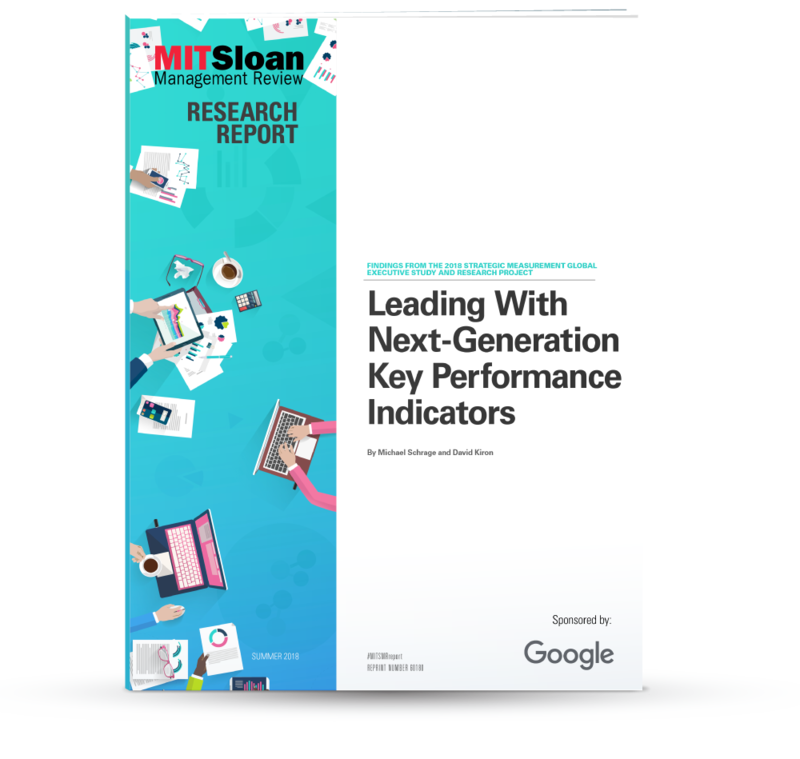 To understand the challenges and opportunities associated with the use of KPIs to manage and lead organizations, MIT Sloan Management Review and Think with Google conducted a survey of more than 4,700 business executives, managers, and analysts from organizations around the world in January 2018. Our analysis focused on 3,225 executive-level respondents; more than 1,600 were marketing executives. The survey captured insights from individuals in 107 countries and 20 industries, representing organizations with a range of annual revenues. The sample was drawn from a number of sources, including MIT Sloan Management Review readers, executive marketing panels, and other interested parties. In addition to conducting the survey, we interviewed business executives from a number of industries and academia to help us recognize the practical issues facing organizations today. Their insights contributed to a richer understanding of the data. Recent research from MIT Sloan Management Review and Google shows a surprising pattern in executives’ use of key performance indicators (KPIs▲We define key performance indicators (KPIs) as the quantifiable measures an organization uses to determine how well it meets its declared operational and strategic goals.1) to manage and lead their organizations. But what sets leading companies apart is not so much the number of metrics they track but how they use them to better engage customers — and thereby grow their businesses. 1. We define key performance indicators (KPIs) as the quantifiable measures an organization uses to determine how well it meets its declared operational and strategic goals. 2. Respondents were asked “To what extent do your organization’s KPIs drive how you lead and/or manage your people and processes?” Those who answered to a moderate or great extent are represented in the 70%. Answers to six survey questions indicate how well a company has aligned its use of KPIs. We calculated the z-scores for each of the six questions and found their respective means. Respondents who scored higher on all six questions received a higher index score, while respondents who scored lower received a lower index score. The respondents were grouped into quintiles. The bottom quintile represents the Measurement Challenged, the middle three quintiles (60 percent) represent the Measurement Capable, and the top quintile represents the Measurement Leaders. 1. To what extent do your organization’s KPIs drive how you lead and/or manage your people and processes? 2. To what extent do you believe your function’s KPIs are explicitly and directly aligned to your organization’s strategic goals and business outcomes? 4. To what extent do you determine and/or set your function’s KPIs? 5. To what degree do you agree with the following statement: I am satisfied with how the KPIs that I manage/report on inform and influence decision-making across the enterprise. 6. To what extent do you (as stakeholder) trust the accuracy and reliability of your KPIs? Our study measured the role of KPIs in aligning an organization toward its objectives. Three categories emerged: Measurement Leaders, Measurement Capable, and Measurement Challenged. Leading companies recognize the complexity customers face in a digital world and develop customer experience KPIs beyond the sales funnel. Organizations at all alignment levels are using customer-focused KPIs.▲Respondents were asked if their functions use KPIs to measure customer segmentation, customer lifetime value, brand equity, and churn. Leading companies are even more likely to prioritize customer-related KPIs to gain competitive advantage. 4. Respondents were asked the free-response question: Excluding gross revenue, what are your three most important KPIs? 38% of respondents used the word “customer” in their response, while the term used with the next highest frequency was “sales” (9%). ... and have incentives to use machine learning. Take our self-assessment to uncover challenges and opportunities based on your KPI alignment. Explore findings from the 2018 Strategic Measurement Global Executive Study and Research Report.